I’m joining Jen & Kellee (and many other bloggers) in discussing what we are reading this week. Join us! Go to their site and link up your own blog. Working on my ridiculous stack of books to read. You can check out my video of it HERE. But I did make some headway this week! Highlights would include Franki Sibberson’s The Joy of Planning. You can read my interview with Franki HERE. The Mal and Chad series by McCraine was a great find. Thanks to Nerdy Book Club for that one. Stephen is Skyping with my class at the end of October. I can’t wait to introduce these books to them tomorrow. Zita was great – as was I’m Bored. Next up – I need to finish Penny Kittle’s Write Beside Them. I’ve been reading it for over two weeks. Not because I don’t love it but because I want to savor it. Also, I have Teenboat on my table to begin tomorrow. Finally – if you are on Twitter, don’t miss the Sharp-Schu book club on Wednesday! 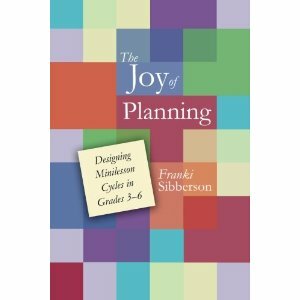 Last week I was blessed to have the chance to sit down and curl up with Franki Sibberson's new book from Choice Literacy called The Joy of Planning: Designing Minilesson Cycles in Grades 3-6. It was just a beautiful book. I felt like Franki and I were sitting and having this conversation over a cup of coffee. She made me rethink some things about planning, gave me new ideas, and left me inspired. I immediately gave a copy to both of my sons' teachers and let my student teacher borrow mine. This is a book you must have in your collection- even if you aren't in grades 3-6. There is information there for everyone. Upon finishing there was so much I wanted to ask Franki about this book, and so many days left until NCTE, so she kindly agreed to an interview. Hope her answers will inspire you as they did me. And I highly recommend her new book. An excellent addition to your professional development library. Where did the seeds for this book originate? Well, when I left my classroom and went into a position as a school librarian, I did a lot of work with teachers, choosing books for lessons, units, etc. I had never really thought about the process of my planning until I had the opportunity to work with so many other teachers. I also never had the time to really think about the ways in which books and resources scaffold students in different ways. As a librarian, I often read a book over and over to different groups of children. Some books naturally invited certain kinds of conversations with children. So, this book is kind of a reflective journey of my planning process. I had done other work on deciding what to teach but this one really focused on the process that comes after that decision and what I discovered about how to get children from where they are to where we want them to be as readers. If you were speaking to a new teacher, what advice would you give them in regard to planning? I think planning has to be about thinking about your children first. We have to know where are students are and where we hope to take them as readers. Once we know that, they it is about planning a very flexible journey. My other piece of advice would be to overplan and then to be okay with not getting to everything. What I’ve learned is that when I overplan, I am able to be really flexible each day with where I go next based on how students respond. 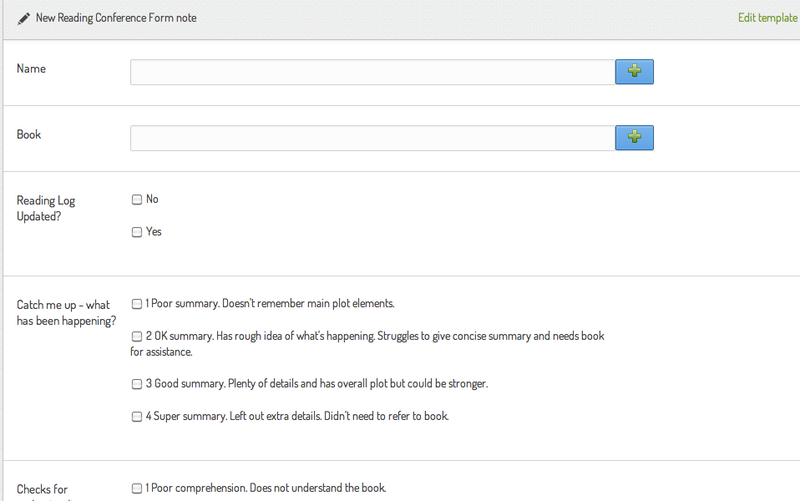 When I overplan, I have more books and ideas than I need and I can pick and choose from this menu as we move along. For years. I overplanned and then became frustrated that I couldn’t get to anything. Now, I understand that the planning process is a way for me to understand where I am going and to think through what support students might need to get there. Then I get started, knowing I won’t follow the exact plan I created. I like how your digital reading life has made such an impression that you share it with your students. What do you feel that teachers must share about digital reading with their students? I am all about authenticity and I realized this year that when I share my reading and writing lives with students, I can’t possibly be honest without including the digital piece of that. So much of my reading life is the same but so much is different over the last few years. For me, it is about really sitting down before I do any minilesson work in which I share my own life as a reader and being really honest. I have to really think through my reading—how much of it is actual books, how much I read on my Kindle, how much time I spend reading blogs. So, if teachers have a piece of their reading life that is digital, I feel like that has to be part of our teaching in order to keep it authentic and grounded. When you sit down to plan, do you plan out the next cycle only or do you have a rough sketch for the semester? I have a sketch that never works out. I think I know where I am going for the year, then I meet the kids. And usually, they are not where I plan for them to be so I need to revamp. I wouldn’t say I have a rough sketch in a calendar, but I do have thoughts about which cycles I am pretty sure will be included each year. I know I want to teach kids to support their thinking with evidence from the text. I know I will want to do lots with nonfiction. Theme is usually important. But I am never sure where those will fit into the year until I see where kids come in to the classroom. I try to start with the thing that will move them forward fastest and then build from there. So, I have a list maybe, rather than a calendar and even the list changes. What do you feel is most often overlooked in regard to planning? I think the small scaffolds are critical and often, when we don’t plan big picture, we miss those. The things we are teaching kids as readers are very complex and without breaking them down for ourselves, it is hard to break them down for students. For me, when I am in a hurry or don’t have the time to put into planning that I need, I tend to plan without this careful attention to the scaffolds that will take kids forward in small steps. I think that planning has gotten such a bad rap by teachers and I love how you seem to look forward to it. What is your number one recommendation to help teachers make this switch in attitudes? I think this is really an issue of time. So much is demanded of teachers today that planning often takes a back seat. I like to plan when I have time to plan and to plan well. I need time to sit at the bookstore or library and find the right resources. I need time to spread out at my kitchen table and think through the whole of it. Without giving ourselves time to plan well, it is no fun. A good 2 hour block gets me to feel really good about my work but anything less than that is hard. So I think it is about not trying to plan in 30 minute chunks but to really give ourselves time to plan well if we are to enjoy it. With Common Core becoming so important in our planning, I was glad to see that you had a balance of non-fiction and fiction lessons. I think many people see the need to increase our readings of non-fiction texts but I believe fiction will still have its place. After studying the standards, what do you feel we need to be aware of? I feel like the nonfiction piece is really telling us that we need more reading and writing across the day. We need to embed literacy in our science and math classrooms. So I don’t think more nonfiction means taking time away from fiction. Instead I think the Common Core standards give students the opportunity to read and write for a variety of purposes across the school day. Colby Sharp tweeted yesterday that reading your book may be expensive – he wants to read every book you mentioned. I had the same problem as I read it this week, so I’m going to ask you the impossible question. If you had to grab five picture books before your collection was lost in a fire – what would those five be and why? Hah! I have old favorites but I tend to love my newest books most. I love falling in love with new books and I am tempted to tell you about the ones I used this week with kids. However, I guess if I had to choose 7 books (5 is impossible! ), books that kids have learned from over and over again in minilesson work (and I am going to stick with picture books), it would be the following. I think these books (along with a ton of others) have lots of possibilities. They invite lots of conversations naturally and kids can grow so much as readers. Note from Katherine: See what I mean? Now there are even more books I NEED to purchase! Franki, thanks for letting me interview you! Today I was trying to explain to a student why I owned a copy of Bad Island by TenNapel but it wasn’t in my classroom quite yet. Trying to explain to a ten-year-old why over a hundred books sat in my bedroom. I read a lot, but not enough to keep up with all the books coming in my home. Too much in – not enough out. Hmm. I have this issue with calories as well. At any rate, I told them I’d videotape my “to read” shelf. I am embarrassed by it. 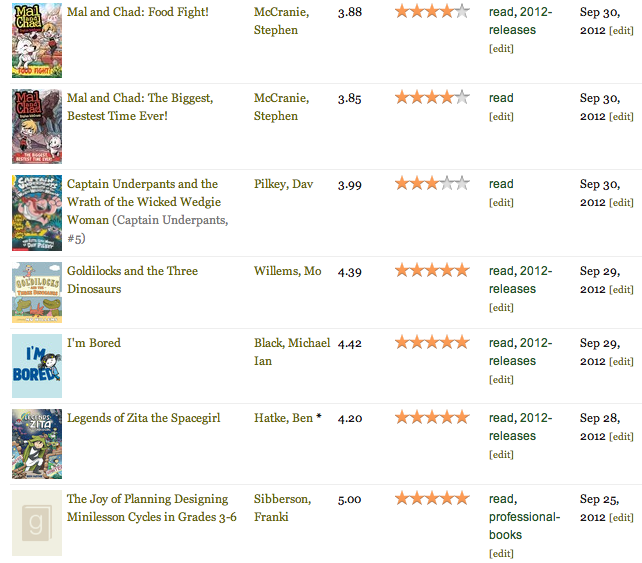 I’ve read 339 books this year so far and it still looks like this. My husband, Chris, would say that it’s an easy problem to fix. Stop buying books! Sorry, honey, not going to happen. As I taped I was well aware of shelves of friends that, I am positive, have more books than this. And I also knew if I took you on a tour of our home you’d find stacks of books by the front door, back door, in baskets downstairs, etc. I did ponder as I taped – I have PD books at school and PD books at home. Educator friends – where do you keep your PD books? I don’t know if I have a reason for the sort – other than if I’m “using” one for ideas for lessons, it’s usually at school. Thoughts? So here’s my bedroom and shelves in all of their glory. Please forgive the headboardless bed – we remodeled and moved into this room just over a year ago but I just can’t find the exact bed I want. Or, to be truthful, I have found it but it costs a ridiculous amount so I wait to see if I truly want it. Welcome to my shelves. One more thing - as I taped this I realized I do not own any PD books by the two great Dons - Murray and Graves. If you needed to start reading their amazing works - which ones would you suggest? Thanks friends! Evernote. A website I wanted to explore this year but was massively overwhelmed and almost afraid to try. A few weeks ago I posted a question on my blog about Evernote. Several replies on Twitter led to a few teachers gathering in a Google Hangout. 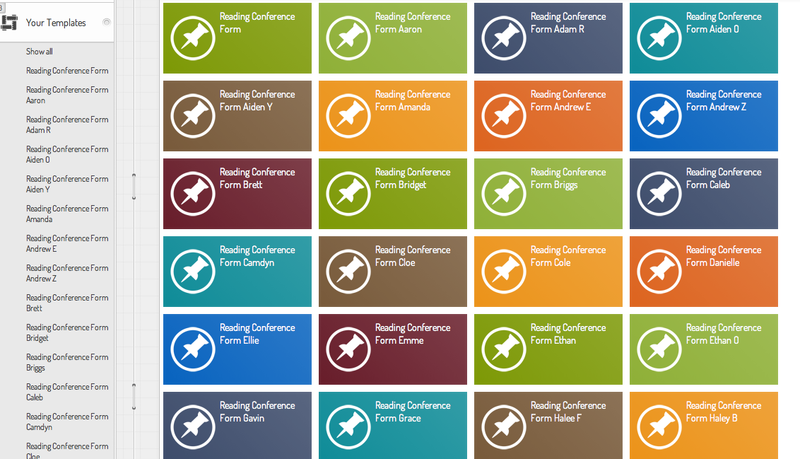 My main question was that I had created a form in Google Docs for reading conferences. 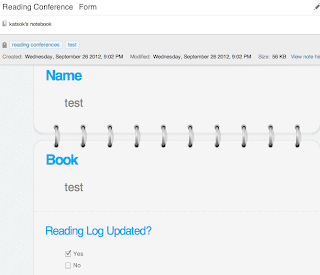 Wasn’t there a way to fill out the form and embed it in my students Evernote notebooks? It seems not. We did discover a way to put the link in the notebooks but the information was still stored in Google. Not to be discouraged, I continued to use Evernote but just took audio recordings of my students reading during conferences and then wrote some quick notes below those. There’s nothing wrong with this but I still wished there was an easier way. Tonight upon reading the blogs stacked up in my Google Reader I came upon one from Evernote (EN) about some website called KustomNote. 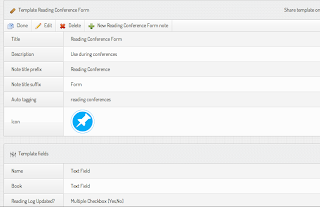 From the description it seemed that you could created forms with KustomNote. I went to the site and logged in with my EN account info. Once there I watched a quick tutorial. 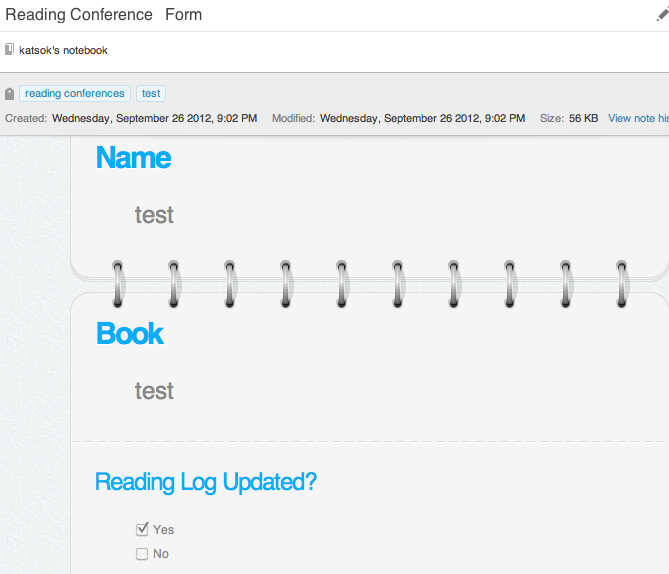 Then, I selected “create a new template.” I called it “Reading Conferences” and filled in the fields. I saved this one to a general notebook of mine. At the bottom there are “note fields.” When I wanted a blank field I chose “text field.” When I wanted checkboxes I chose “multiple checkbox.” I left possible values, note title, and tagging blank. From this I created my first template. Then came the redundant work. I have a notebook for all 72 kids in reading. 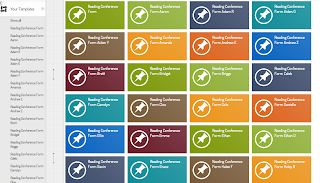 I went to the template I had created and selected “clone.” Then I’d select my first student’s notebook and write their name in the title with “Reading Conference Form” and save that template. Then, I’d go back to the original form and select “clone” again and repeat the same steps with the next student – 71 times. Surely there is a faster way to do this but I couldn’t figure it out. 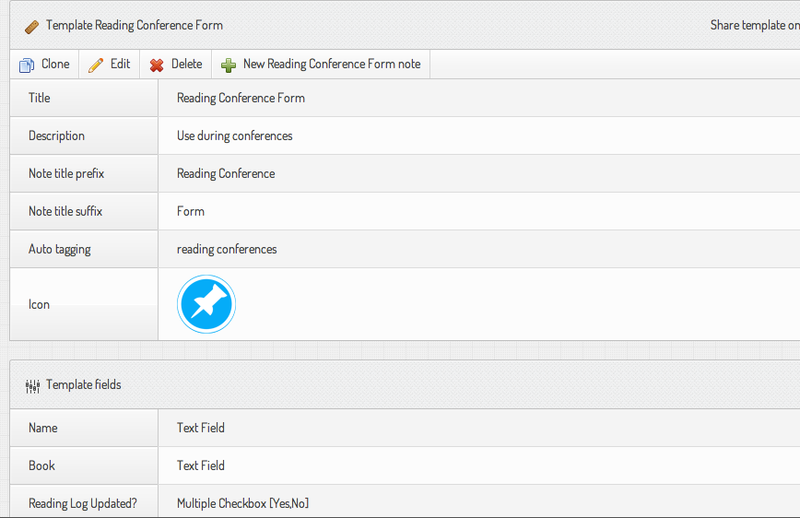 The reason this step was necessary, I think, was because when using the form you can’t alter which notebook the info goes to. So this way I have a master reading form for each student. When I create a “new note” from that form, the information will be sent to their notebook. The only two downfalls I see are as follows. 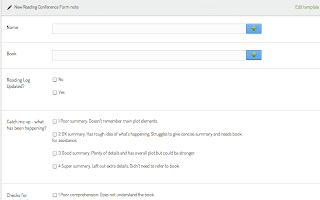 One – I think you have to go to the KustomNote site to edit the forms, not Evernote. It will send the info directly to EN but as far as I can tell, this is required. I’ve saved a link on my homescreen on my iPad right by my EN app to make this easier. Two – I don’t see a way to record audio in this. So I think I will alternate my conferences. Audio and quick notes one day, form the next. So my eyes are bleary, my hands are tired of typing, but I’m super excited. Hoping this works well but I won’t really know until I can use it with my kids. I did a “test” one, as you will see in the screen shots, and it seemed to work great. Tomorrow’s a field trip day so I will try and report back on Friday. My template (part of it). Click on the green plus to add a note. How the format changes when you add a note. What the note looks like when sent to EN notebooks. My home page with all student "master" forms. Select one, add new note, and is sent to EN. What do books teach us?